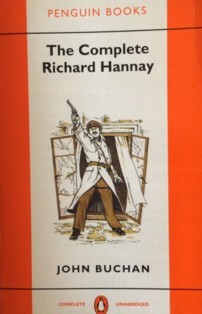 I really enjoy John Buchan's Richard Hannay thrillers so it was great to realise that the fourth novel, The Three Hostages, was published in 1924 so I could read it as part of Simon & Karen's 1924 Club. Even better, I had the book on the shelf & as an eBook so I wasn't tempted to buy a copy. Richard Hannay is settled at Fosse, his home in the Cotswolds. The War is long over, he's married to Mary & they have a son, Peter John. Hannay wants nothing more than to spend his days fishing & working on his estate. He's vegetating with a vengeance. ... the place wanted a lot of looking to, for it had run wild during the War, and the woods had to be thinned, gates and fences repaired, new drains laid, a ram put in to supplement the wells, a heap of thatching to be done, and the garden borders brought back to cultivation. I had got through the worst of it, and as I came out of the Home Wood to the lower lawns and saw the old stone gables that the monks had built, I felt that I was anchored at last in the pleasantest kind of harbour. So he's less than happy when he's contacted by his old boss, Macgillivray, who wants his help in solving a mystery involving an international crime syndicate. Macgillivray's men are about to round up the members of the syndicate but, as extra insurance, they've taken three hostages. Adela Victor, daughter of a rich banker; Lord Mercot, heir to the Duke of Alcester & David Warcliff, the eight year old son of soldier & administrator Sir Arthur. On the face of it, there seems to be no connection between the three cases & Hannay is reluctant to become involved. His conscience begins to bother him, particularly about young David after a visit from Sir Arthur & eventually he agrees to help. The only clue he has is a piece of doggerel, six lines of verse about the fields of Eden & a blind spinner, sent to the fathers of each of the hostages. The lines trigger the recollection of a conversation, half-remembered by Hannay's friend, local doctor Tom Greenslade, & this sets him off on the trail of a criminal mastermind who is too subtle to use physical violence but instead steals the souls of his victims through hypnosis. "There's such a thing, remember, as spiriting away a man's recollection of his past, and starting him out as a waif in a new world. I've heard in the East of such performances, and of course it means that the memory-less being is at the mercy of the man who has stolen his memory." John Buchan is so good at writing a tight, fast-moving thriller but what I enjoy almost as much as the plot (& there is a fantastic twist near the end that I didn't see coming) is his sense of place. His descriptions of Scotland are always gorgeous but Hannay's home in the Cotswolds & the trip to Norway are just as evocative. I especially enjoyed the peace of Fosse as the still centre of all the chaos around the chase. It becomes a metaphor for England's place in a world still recovering from the Great War & reluctant to become involved in the world's woes. Hannay is so very noble, his stiff upper lip barely trembles except when he thinks of young David Warcliff or thinks his family is in danger. There are a few distasteful references to race & eugenics (the shape of the villain's head is seen as a sign of his degeneracy) but such references are of their time & if you read books published in the early 20th century, you have to accept, or at least learn to discount, the attitudes of the time. 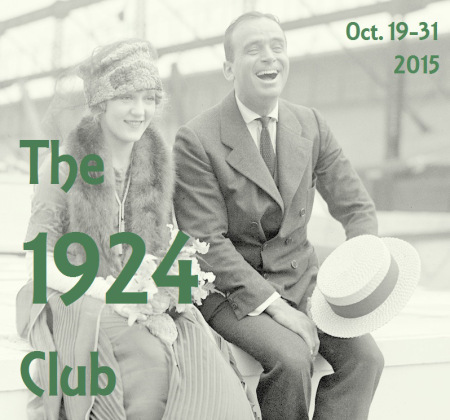 I loved The Three Hostages as an atmospheric thriller & I'm so pleased that the 1924 Club inspired me to read it. John Buchan's sister, Anna, wrote under the name O Douglas. 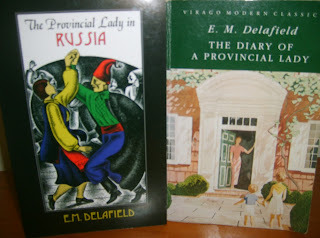 She also published a book in 1924, Pink Sugar, & I reviewed it several years ago here. I'm going to suggest Buchan's books to my husband...he's been enjoying the British Library Crime Classics and this title ticks some boxes. The BL have also started a series of reprinted thrillers. I haven't read any of them yet but they have very noirish covers. I think your husband would enjoy Buchan if he's reading the BLCC. Are you sure? There is a lot of scenery involved... I'm looking forward to seeing what others are reading for the Club. I adore Anna Buchan's books but have yet to read John's. There are a couple of them on my shelf though. This review definitely makes me want to get to them sooner rather than later! I also enjoy Anna's books, I discovered them through the Greyladies reprints. Both Buchans have a great love of Scotland & the landscape & that comes through, even in JB's thrillers.